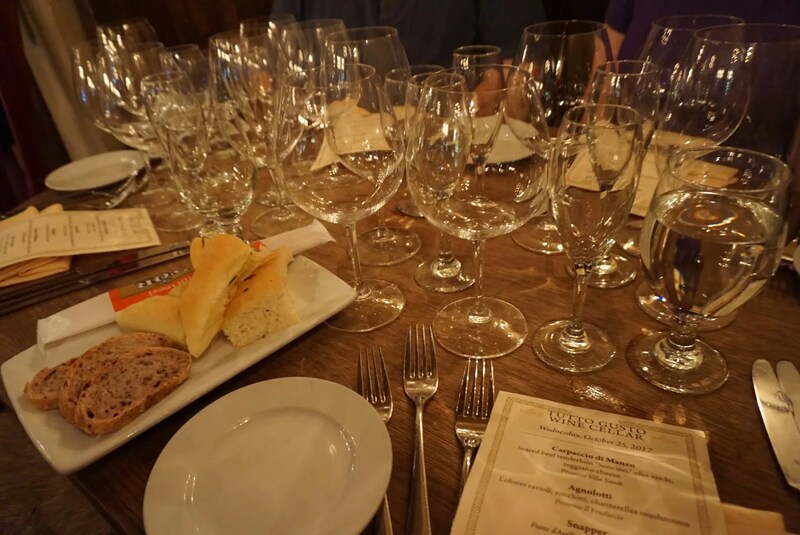 I attended my first Italian Regional Food & Wine Pairing Luncheon (held at Epcot’s Tutto Gusto Wine Cellar) in October 2014. I enjoyed it so much that I’ve attended every year since then, so this was my 4th time. Though the bar was set high with that first experience in 2014, each year they somehow managed to top what they had done the previous year. Our last lunch in 2016 (attended by Paula, Hunter, and myself) was absolutely amazing, so we were anxious to see what culinary delights were in store for us this year. 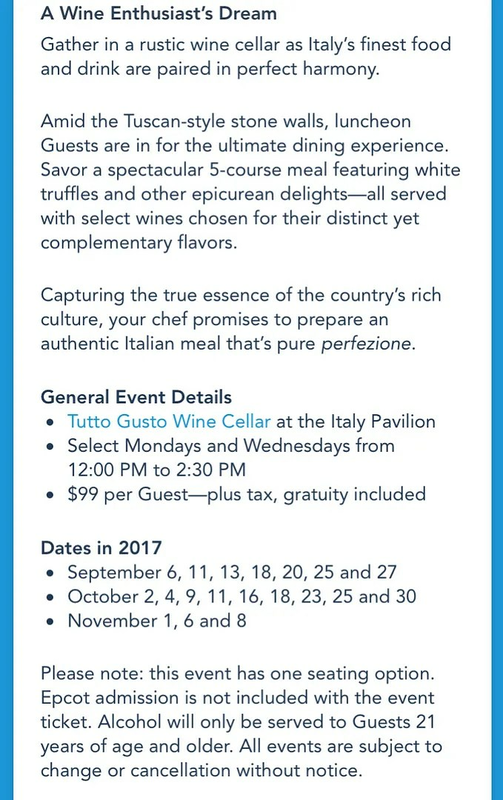 Therefore, my friends (Paula & Hunter) and I were excited to see on the official Disney World website that this year’s lunch would again feature white truffles. This was a definite selling point for our friend, Rachel, who we talked into taking off work to attend this Wednesday afternoon lunch with us. 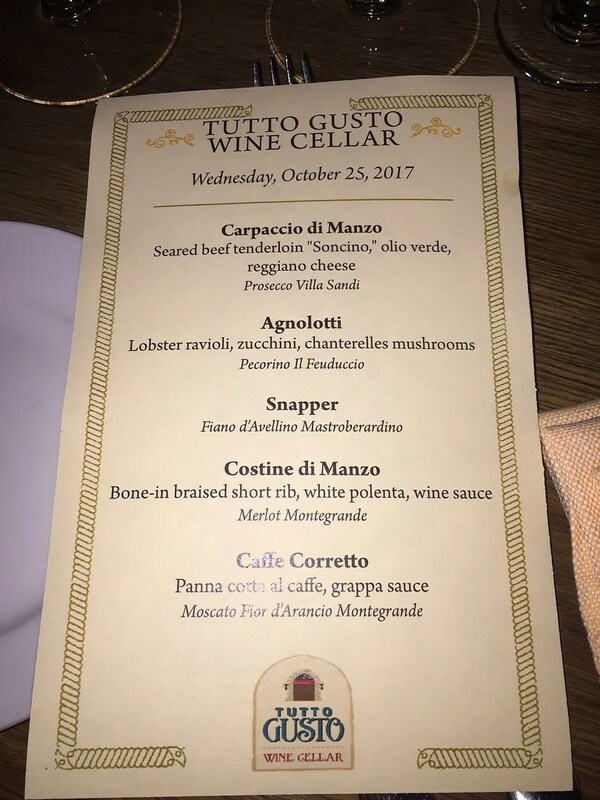 And so the four of us checked in for our prepaid Italian Regional Food & Wine lunch ($99 plus tax, gratuity included) held at noon on October 25, 2017 at Epcot’s Tutto Gusto Wine Cellar. We were seated at a 4-top table back against the corner wall near the door to the bar. While it was nice to have a table all to ourselves (in previous years I’ve always shared a table with strangers, although they were always nice), it was very dark in the corner of an already dimly lit room so I’m afraid my photos are less than great. But nevertheless, here they are…starting with my place setting. Anyway, six of those glasses were mine. One was for water and the other five were for the wines which were paired with each of the 5 courses that were served at this lunch. Also on our table was a shared bread plate with focaccia, hard breadsticks (packaged), etc. 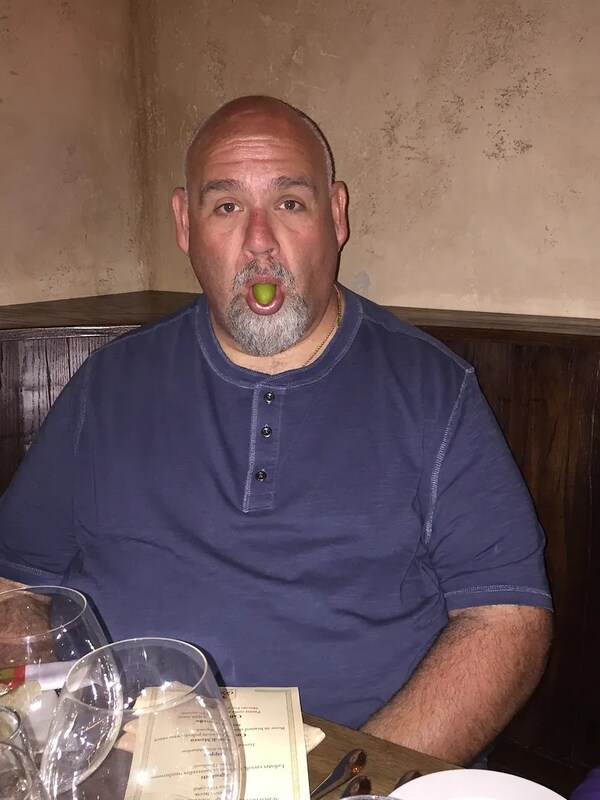 and a plate which held some green olives and a bowl of olive oil. Photo Caption: DisWait Hunter, I haven’t taken a photo of the olives yet!! And as you can see, there were no white truffles listed as an ingredient in any of the courses. 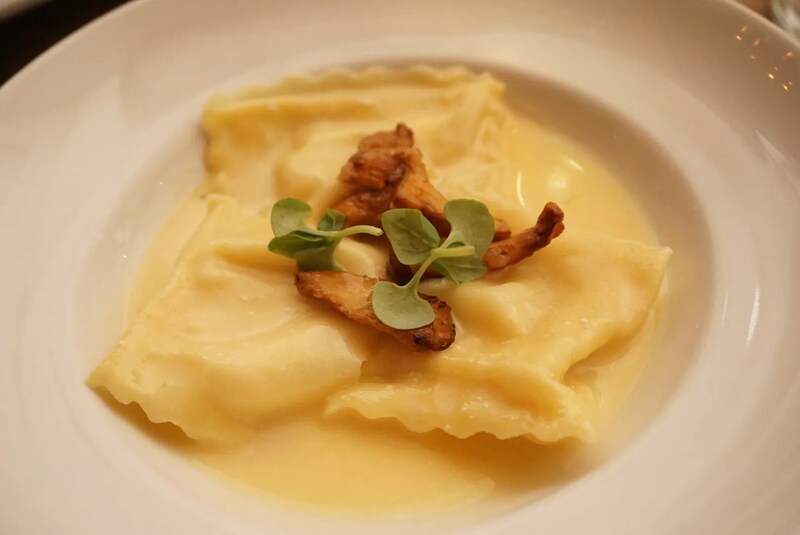 When we asked about this we were told that they did not ever plan to serve white truffles at this year’s luncheon so the Disney website was inaccurate…so BOOOO to Disney for the false advertising! 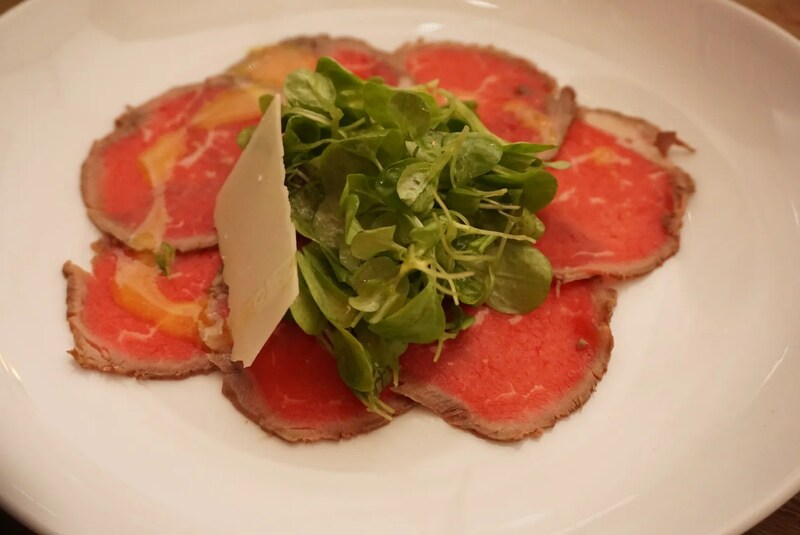 I must admit that I don’t recall ever having beef carpaccio before, as the thought of eating raw meat was not appealing to me. However, I trusted my dining companions, so when they said it was delicious I dug in to the thinly sliced raw beef on my plate. And they were right, this was delicious! I believe that we all agreed that this was our favorite course of this meal. Another great course which was enjoyed by all, except for Hunter who couldn’t have the lobster-filled ravioli because of his seafood allergy. 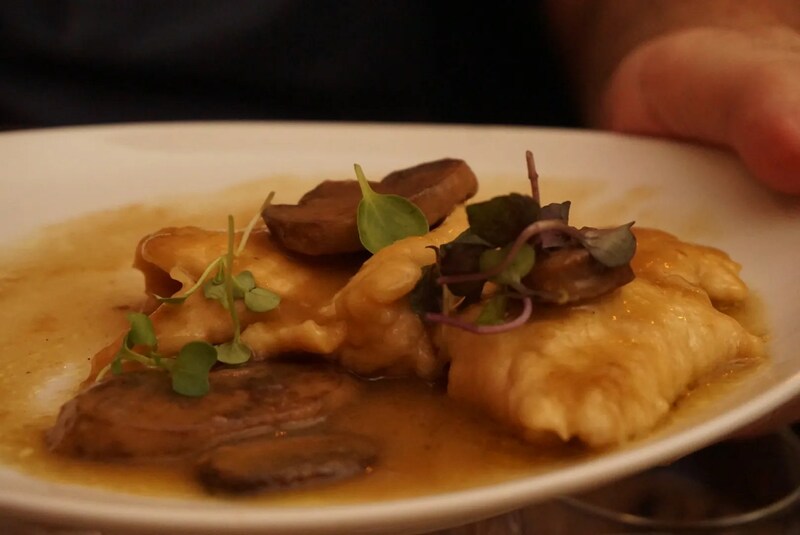 His ravioli was therefore filled with only ricotta cheese, which he said was nothing special. Again he said this fine but nothing special. Paula thought this was a little dry, but I liked it a lot. 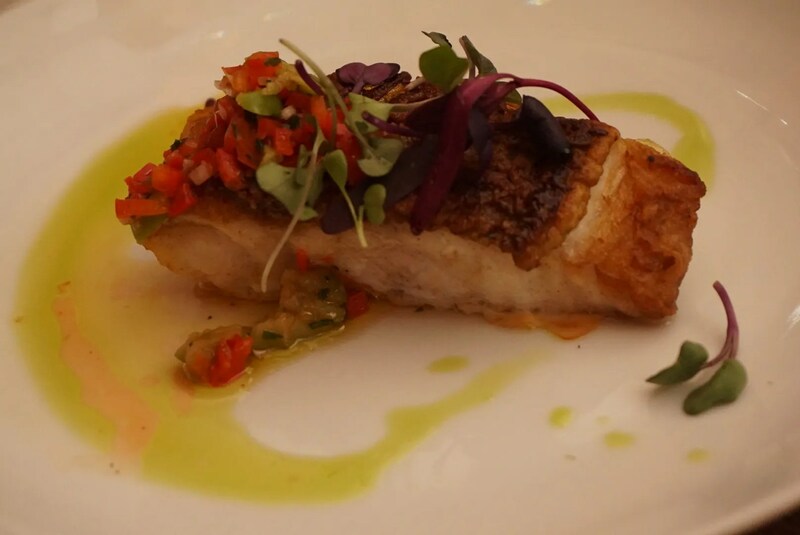 For me, it was more moist than the halibut I had had the night before at Epcot’s Monsieur Paul. I’m generally not a fan of short ribs though because they tend to be fatty. And this short rib was no exception. My serving (and I think maybe Rachel’s too) was very fatty. I should though add that I believe Paula and Hunter both enjoyed their short ribs. 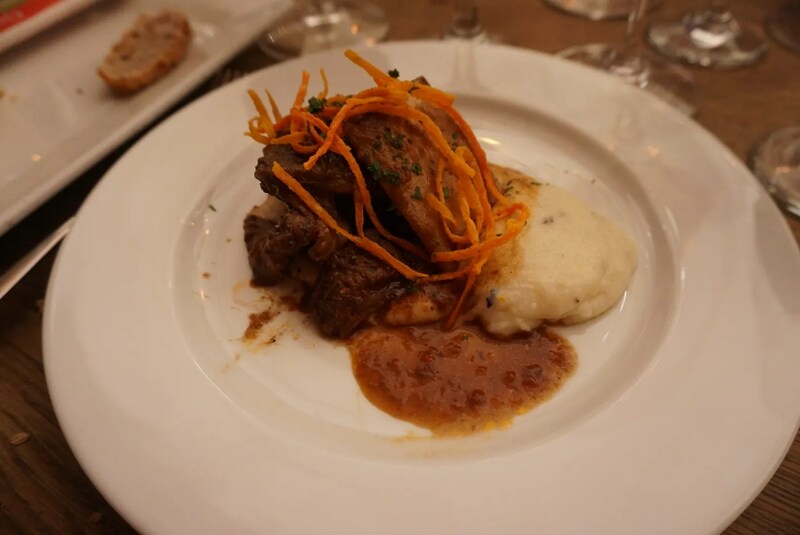 As for the wine pairings, the first three courses were paired with white wines. All of these were good, but my favorite was the Prosecco which was served with our first course. I believe the others though preferred the third white wine we were served, Fiano d’Avellino Mastroberardino, which I recall as being the most full-bodied of our three white wines. As for the second wine served, the Pecorino Il Feuduccio, am I the only one that thought pecorino referred only to cheese? Until now I wasn’t aware that pecorino was also the name of a grape grown in the Abruzzo region of Italy, which happens to be the home my ancestors and an area that I visited in 2009. Red wine, a merlot (Merlot Montegrande), was served with our meat course. I’m not a fan of merlots, so it wasn’t a surprise that I didn’t care for this wine. Paula thought it paired well with our short rib dish though, so I gave her my glass…or was that Hunter that I passed my glass of merlot to? Well, anyway, there was no wine wasted at our table. While this was both tasty and pretty, it wasn’t as delicious or beautifully presented as last year’s tiramisu dessert. This course was served with Moscato, which can be a hit or miss for me. This one was a miss, as it was super sweet…too sweet even for me. So overall, I thought this was another great Italian Food & Wine Pairing Lunch and was worth the price of $99 + tax. However, I would have to say that this lunch was not as good as the one served to us in 2016 (which was phenomenal). Though the pattern of progressively better lunches had been broken, I did not regret choosing this for my one Disney special Food & Wine Festival event this year. In previous years I had attended as many as 6 paid events, but this year I decided to cut down on my trip expenses and attended just one. 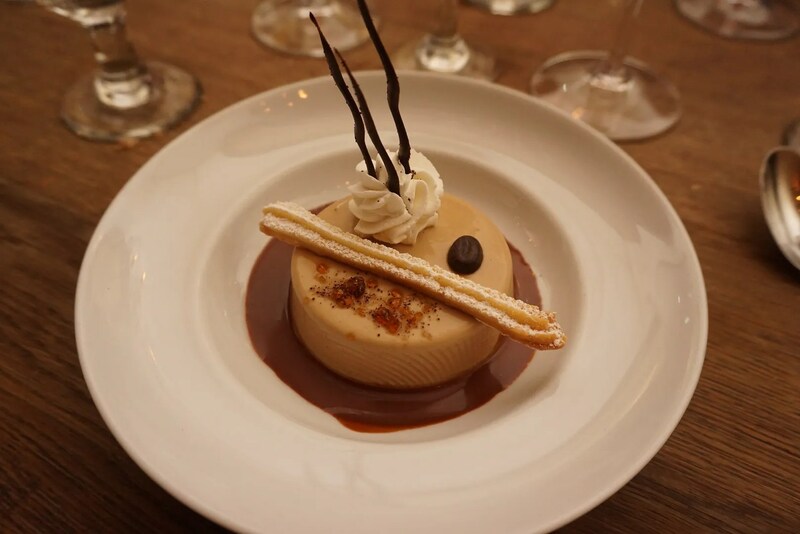 The Italian Regional Food & Wine Pairing Luncheon turned out to be a good choice!